What is Diplodia shoot blight and canker? Diplodia shoot blight and canker (formerly Sphaeropsis shoot blight and canker) is one of the most common fungal diseases of Austrian pine in urban settings in Wisconsin. This disease can also affect other pines including red, jack, Scots and mugo pine, as well as other conifers including cedars, cypresses, firs, spruces and junipers. What does Diplodia shoot blight and canker look like? Initially you may notice branch tips that ooze a large amount of resin. Eventually, these branch tips brown and die. Often, the newest needles on these dead branches will be of different lengths. As the disease progresses, sunken or swollen, discolored areas (called cankers) may form on infected twigs. Heavy resin flow and an absence of tunnels help distinguish Diplodia shoot blight and canker from damage caused by insect pests. Where does Diplodia shoot blight and canker come from? Diplodia shoot blight and canker is caused by the fungus Diplodia pinea (formerly known as Sphaeropsis sapinea). The fungus survives in infected shoots and pinecones where it produces small, black fruiting bodies and dark-colored spores. How do I save a tree with Diplodia shoot blight and canker? Immediately remove and destroy diseased branch tips. Prune branches six to eight inches below the point where they are obviously infected. Prune only in dry weather. Between cuts, disinfest shears by dipping them for at least 30 seconds in a 10% bleach solution or alcohol (spray disinfectants that contain at least 70% alcohol can also be used). This will prevent accidental movement of the fungus from branch to branch during pruning. Also, where possible, remove and destroy pinecones from infected trees. How do I avoid problems with Diplodia shoot blight and canker in the future? Stressed trees are more likely to be infected by Diplodia. Therefore, minimize any stresses to established conifers. Water your trees adequately, particularly during dry periods. When planting new trees, be sure to allow ample space for roots to grow, avoid compacting the soil around your tree and make sure there is adequate soil drainage. 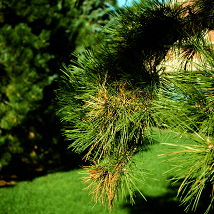 Also fertilize your conifers properly (every three to five years), but do not overfertilize, particularly with nitrogen. Finally, you may want to apply a fungicide containing thiophanate-methyl or chlorothalonil (or a combination of both products) at 14 day intervals between bud break and full shoot elongation to help prevent infections. Be sure to read and follow all label instructions of the fungicide that you select to insure that you use the fungicide in the safest and most effective manner possible. For more information on Diplodia shoot blight and canker: See UW-Extension Bulletin A3643, or contact your county Extension agent. Thanks to Jean Ferdinandsen, Scott Reuss and Amy Sausen for reviewing this document.